We have a post that is just jam-packed with excitement! We've got a DT Call! Shall we start with that? 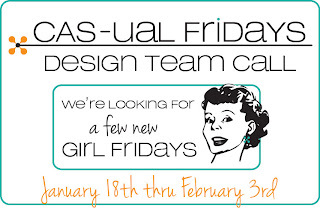 CAS-ual Fridays is looking for a few new Girl Fridays to join the challenge team! 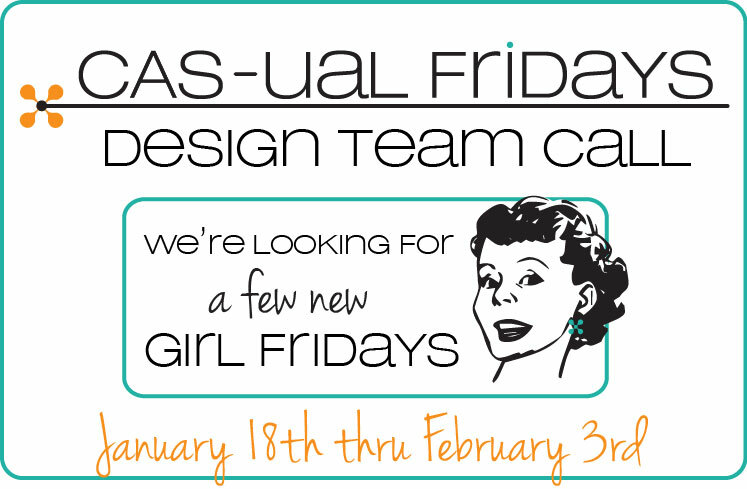 If you are a CAS loving designer, this is the call for you! I'd LOVE for you to apply! * Do you love Clean And Simple Design? * Do you get excited about a good challenge? * Do you have an active blog? * Can you create weekly inspiration projects with at least 3 weeks advance notice? *Can you take crisp, clear, bright photos? * Do you enjoy visiting and commenting on player's blogs? * Can you commit to a 6 month term, March through August? * Would you have fun designing occasionally with sponsor supplied goodies? * Are you an easy going team player who likes to have fun? If you are nodding your head, and jumping up and down because I just described you, then I want to get to know you! Deadline to apply: 11:59 pm EST on Sunday February 3rd. CFC86: Create a CAS card that has one long side and one short side. 3 x 6, 4 x 8, etc. No standard A2's for this week. CAS-ual Fridays Stamps- Clean And Simple designs for any stamper's style. Founded in 2012, our clear photopolymer stamps are of the finest quality, and produced in America's Heartland. We are super excited to present our January release that has 3 brand new 4 x 6 stamp sets. This week's winner will receive a $20 gift certificate to the store!! Wow! All such fabulous cards! I see cards by the DT. The stamps could also be used on layouts. Are scrapbookers welcomed to apply or just cardmakers? Also how make creations/projects are required per month? Also how many creations/projects are required per month? Love the DT samples, looking forward to playing along in this challenge! WOW! AWESOME cards and super exciting news!!!! Thanks for a fun challenge and terrific inspiration. Fun challenge idea and fab cards from all the designers! Another fun challenge, Michele! The DT cards are, as always, stunning! I like making long cards and they fit so nicely into business envelopes, so thanks for the reminder to do it more often! This is a fun challenge. I'm loving the long and short of it and inspired by the DT's entries.